Our main product fall into 3 catigoreis HALT/HASS, Vibration Systems, and Turnkey Systems. We also offer custom solutions based on user requirments. If you have a request please contact us. Our company is particularly pleased to offer engineering test solutions and unique and customized environmental test equipment and systems for product quality and reliability. Included are specialized environmental chambers as well as a complete line of advanced Highly Accelerated Life Test (HALT) and Highly Accelerated Stress Screening (HASS) chamber systems. 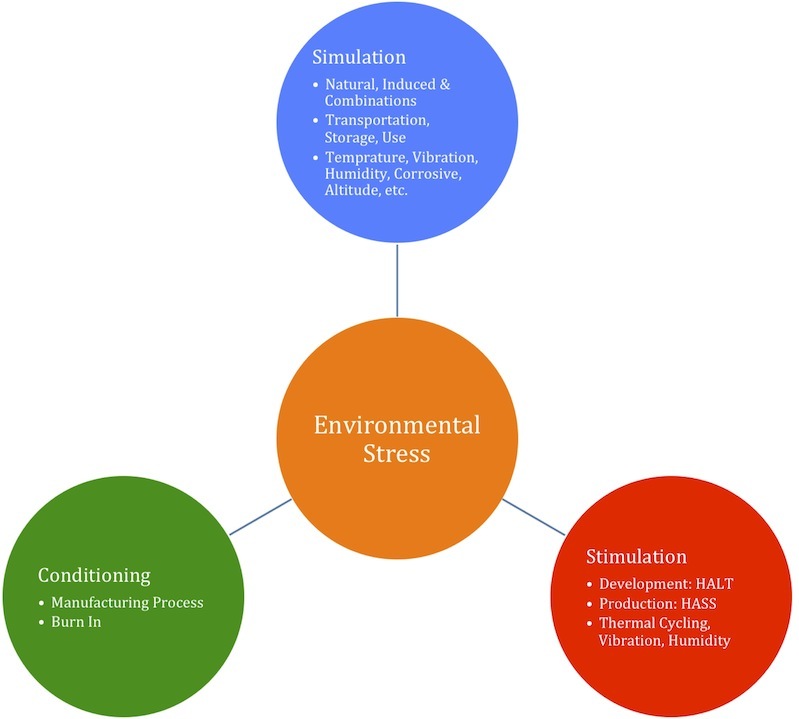 Environmental simulation of natural and induced environments are the traditional test applications for product design evaluation and development. Simulation of product transportation, storage, and use environments typically include temperature, thermal shock, humidity, vibration, shock, salt spray, altitude to name a few. We specialize in customized environmental equipment solutions. Environmental stimulation of products for improved product quality and life typically utilizes temperature, vibration, and optional humidity singularly and in combination, to precipitate product latent defects. Environmental conditioning during manufacturing can require many unique and specialized environmental conditioning and processing chambers and equipment. We have accepted many challenges in this area and have provided a successful equipment response and solution. IMPORTANT: Environmental stimulation has no relationship to environmental simulation of product environments. It is simply an application of environmental stress find product failures. (Read More). Two important application areas are: Highly Accelerated Life Test (HALT) and Highly Accelerated Stress. Screening (HASS). See HALT/HASS Chamber performance specifications and models sizes (Read More). During Environmental Simulation we look for products to pass. This application typically simulate the natural, induced, environments singularly or in combination during the product development and/or qualification of products to their environmental specifications. Product development under environmental conditions is an iterative process, Test, Analyze, And Fix, (TAFF) and can take a relatively long time. During Environmental Stimulation we look for weak product components to fail. Product development under environmental product stimulation is also an iterative process, Stress, Analyze, And Fix, (SAAF) and can take a relatively short time. During Environmental Conditioning we subject products to environmental conditioning or stress as required by the manufacturing requirements.Environmental chambers typically have different characteristics and configurations for the each application. HALT, by means of ever increasing environmental stress step levels determines product design limits (margin) and destruct limits. This is also an iterative process as noted above, "SAAF". The result is a robust product with extended life. HALT is also very useful in estimating product life and warranties particularly if normal levels of usage stress are known. HASS utilizes information from HALT to establish screening strength levels for use in production. If a HALT has not been performed the screening strength can be determined through step-stress-testing similar to that done in the HALT method. In all cases the levels of stress are tailored for each product. The objective is to precipitate weak components, workmanship problems or process problems, determine root cause and take corrective action while taking minimum life out of the product.